Is a turtle worth risking your life? A newly-hatched green turtle wandered into my tent this evening, attracted, perhaps, by a lantern that the reptile thought was the reflection of the moon on the sea. A few hours later I wander the beach on the windward side of this small island, closer to Australia than the Indonesian capital of Jakarta, blown sand gritting my contact lenses, looking for the tractor-like tracks that indicate an adult meter-long turtle has visited the low dunes to lay her eggs. It is a night with stars like I’ve rarely seen, and I half expect Alfred Russel Wallace, the Victorian naturalist/explorer/philosopher to appear out of the shadows, gaunt and curious and quietly eager to join me. I’ve been on his 150-year-old trail for some time now, and I feel his presence as I examine small piles of sand that mark where one of these green turtles has laid her eggs. But, perhaps in too much of a hurry, she has deposited eggs below the high-water line, where they are certain to become water-logged and spoiled. I finally unearth her 60 fresh eggs, still slimy with turtle juices, and transplant them into another hole I dig a few meters beyond the reach of the high tide. Yet amidst this exuberance of life I smell death. I wander the beach and, like a dung beetle, am drawn to the rotting carcasses and bleached skulls of turtles which had been slit open by fishermen desirous of the 200 or so eggs in the reptile’s egg cavity, fishermen either too impatient or too greedy to be satisfied with catching 50 or so eggs as they plop out during the normal cycle. The tasty turtle flesh has been left uneaten to rot; the only part used was the stomach, which makes a fine bait. Earlier the research group I was with had been cruising a few hundred meters offshore and through binoculars noticed a pile of upside-down turtles on the beach. Perhaps half a kilometre away, and about a hundred meters off shore, we also saw the boat that was used by the turtle poachers. We could see that their fishing boat was full of live turtles, all upside down so they wouldn’t move, perhaps a hundred of the animals, all destined for the meat market in Bali. “Poachers,” muttered Fata, an Indonesian game warden. Quickly the situation became like a cowboy movie. “You go chase the boat,” Fata instructed. “I’ll rescue the turtles,” he said as he jumped into the warm water and swam to shore. We then turned to shore to pick up Fata, who was nowhere to be seen. Minutes later Fata appeared from the bush and told his story. He had turned over eight of the 100 kg animals and watched them escape into the sea before three poachers, who had been resting some distance away, saw what he was doing and gave chase. The three poachers were armed with machete-like parangs. Fata was alone and had no weapons. He took shelter in the woods until the fishing boat we had chased came close to the island to pick up their crew members. I admired Fata’s bravery. And was angered by the timid reaction of the Indonesian boat captain, and the government’s inability to provide adequate manpower and resources. 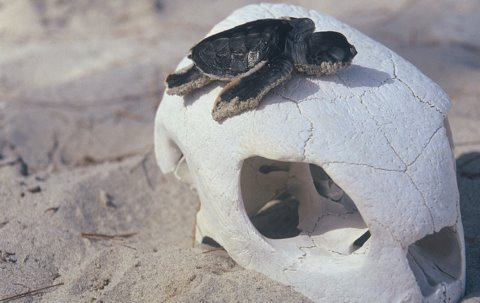 So that night, watching a newly-hatched turtle poke his head out of the sand, I wondered. What is a turtle worth? Worth getting stabbed for? Worth shooting someone for? I’ve been thinking about many things on this trip. How is it, I asked the memory of Alfred Russel Wallace, that we human beings will travel halfway around the world and suffer physical discomfort in order to reach a beach where green turtles come ashore to lay their eggs? Why would we watch another creature’s life cycle — laying and hatching — with such emotional intensity and intellectual curiosity? Why would it disturb us that others of our race — the Balinese in this case — enjoy eating this ancient reptile? Why do we have such protective thoughts about another species? Later, in Bali, I wanted to know just how important turtle meat is in that island’s Shivaistic Hindu culture. This was not merely being environmentally-politically correct. It’s also good conservation to understand what emotional and spiritual values lie behind what seems to outsiders to be senseless consumption — some 18,000 turtles a year, according to one estimate. “Turtle meat adds something to our ceremonies,” explained I.B. Pangdjaja, head of public relations at the Bali Governor’s office. “But it’s not essential to the religious ceremony?” I asked. Odd, isn’t it. Transported to Bali for satay, or worse, slit open for their eggs, and left to die on the beach. And then, against all odds, life goes on — more turtles come ashore to lay their eggs. Because we happen to be on Pulau Enu on this particular night the bad guys stay away, and just maybe tonight’s crop of eggs will hatch. I call this contradictory place Shiva’s beach. A beach of destruction and creation. I awake before dawn the following morning and watch a bunch of just-hatched turtles, shorter than my thumb, scamper like reptilian puppies to the sea. After they all reach the sea safely I strip so I can wash off the sand and bathe in the limpid sea which has been baptised by just-born turtles. After my swim I walk back to the nest site and see a straggler turtle emerging from the quickly heating sand, half an hour behind his nest-mates. I follow his clumsy but determined flipper steps into the sea, and swim with him for maybe 30 meters. He paddles aggressively, sticking his little head out of the water every four seconds. The water is clear and warm, free of hungry fish or crabs, the sky blue and free of birds of prey. The little fellow swims towards a group of seven fishing boats far offshore. “Stay away from people”, I shout, but he doesn’t listen. The sea is big, though, and perhaps he will pass his life free of hassle. Soon he finds his own course and paddles out of sight. A boy. He isn’t going to listen to me. He doesn’t really know where he is going, but he knows he has a journey to make. I wish him well, as much for my sake as for his.